It’s Christmas. It really is the most special time of year. The reason it’s so special is because God entered earth as a baby. And when that happened, it sent shock waves through history. Today, the birth of Jesus is still radically impacting our culture today. How? Think about most of the Christmas movies produced. The themes around Christmas are, ‘believe’, ‘hope’, and ‘love’. Even if you don’t believe in God, in general, people are impacted by some awareness that this time of year is different. When Jesus entered earth as a baby, He radically changed the world with God’s message to the world. His birth is still impacting us today. And as awesome as it was then, is as relevant as it is today. Our teaching series this December is called ‘Immanuel’ which means, God is with us. Stop and think about that for second. God is with us. Do you connect with that? Is that your reality? Are you walking into the Christmas season excited to celebrate the fact that God is with you? Or when you hear that, do you internally think, ‘Ya right, if God was with me, then my life would be better. I would be healthier. I would be wealthier.’ Now you would never publicly say that, but inside you think it. Maybe you were raised in church, and you have heard this message so many times, your eyes kinda gloss over and to you it’s just the same story you have heard for years. Maybe for you, it’s hard to connect the birth of Jesus thousands of years ago to how it changes your life today. That’s what I want to talk about today. For my talk to make sense today, I need to begin by explaining something very important. We need to talk about who God is. God is made up of three parts. We call it, the trinity. God the Father, He is God. God the Son, that is Jesus. And God the Holy Spirit. All three are God. If you want me to explain that, I can’t. It’s a God thing. Just something to think about. If you could explain God, then He’s not much of a God is He? All three parts of God have distinct roles to play. God is our loving Father and He is in heaven. Jesus is God who entered earth, lived, died and was resurrected. Jesus was God in human form and walked through every struggle you and I walk through. The Holy Spirit is God who lives inside us today. The Holy Spirit is God in you who gives you power, authority and at the same time, softens our hearts and gives us compassion. Knowing who God is, let’s jump into scripture. Ready? God in heaven loved you so much that He sent Jesus into earth to die for you. Now think about what that meant for Jesus. He is God and He allowed Himself to be crushed by the very people who He created. Again, scripture explains this. Before I move on, I want it to hit your heart. That happened because God loved you. Jesus leaves heaven to die for the very people who would reject Him, humiliate Him and kill Him. So how did God send Jesus into earth? 18 The birth of Jesus took place like this. His mother, Mary, was engaged to be married to Joseph. Before they came to the marriage bed, Joseph discovered she was pregnant. (It was by the Holy Spirit, but he didn’t know that.) 19 Joseph, chagrined but noble, determined to take care of things quietly so Mary would not be disgraced. 23 Watch for this – a virgin will get pregnant and bear a son; They will name him Emmanuel (Hebrew for “God is with us”). It’s called Christmas. It’s the story of how God sent Jesus into our world to make everything right. It’s a story about how God became human. It’s unbelievable. To you, hearing this, it may still seem like a great story but not really relevant to you today. Let’s keep reading. As Jesus spent time with His disciples, listen to what Jesus told them? What did Jesus say? I am leaving you and when that happens, the Holy Spirit will come. Do you see it? God is made up of three parts and each part has a role to play. God, our loving Father, is in Heaven. God the Son, Jesus, was sent to die for us. God the Holy Spirit was sent to live in us and reproduce God in us. Jesus was saying, I am one person. I have to leave so that God, the Holy Spirit, can live in everyone. Right now, there is one healer. One teacher. One person. When I leave, it’s better because God will be in you all. Jesus told is, it’s better! Why? Because God will finally live in us. How did God the Holy Spirit come? Let’s keep reading. Here is what I want you to know today. 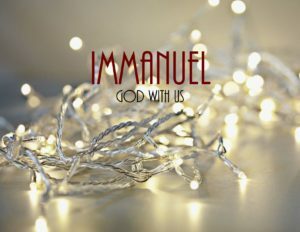 Immanuel means God is with us. Our celebration of Christmas is about the birth of Jesus, the entry of God into our world. The story of when God became human to love us. And, it’s every bit as relevant today as it was then. God is with us because He sent the Holy Spirit to live in us – today. What happens when the Holy Spirit lives in us? Let’s read. Do you see that? That’s amazing. That’s what the Holy Spirit does. He reproduces God in us. It literally is God in us. When I started this talk, do you remember how I started? If you hear that God is with you and you internally think, ‘Ya right, if He was with me my life would be better. I would be healthier. I would be wealthier.’ You may have missed why God is here. It wasn’t to get you the American prosperity dream, that’s found nowhere in scripture. It was to heal your heart, forgive you or your sins, and to reproduce God in you. It’s about your heart. Think about this. When Jesus was born, most people missed Him. They wanted a military leader to conquer Rome. Many people today miss the meaning of Christmas because they think, ‘God with us’ means God will give me the American prosperity dream. Remember is said, maybe If you grew up in Church and you hear the Christmas story again, your eyes kinda gloss over and you think it has no relevance to your life today? You couldn’t be more wrong. Maybe you missed why God is here. Maybe you have been around church so long you have just gone through the religious motions, the stories, the traditions and have missed the point. God lives in you and it should radically change your heart. With the rest of my time today, I want to share with you how the Holy Spirit reproduces God in us. But, the first thing I have say is that many people make a huge mistake. They read this list of nine things and think, “To be a good Christian, I have to make it happen.” They try to be more loving. They struggle to be more joyful. They read more books to be more peaceful. They begin to strive and struggle to make it happen. They try to be more disciplined. They go to more bible studies to get more knowledge. They get accountability partners. What happens? They start with passion and it always fails. Why? Scripture says, the Holy Spirit reproduces God in us. Scripture does not say, you must create those things. You can’t reproduce God in you. To actually try to reproduce God is naïve and prideful. Only God can produce God in you. When people try, with their own efforts, to reproduce what only God can produce and fail, what happens? They try to fake it. They try to act like they are more loving, more joyful, more peaceful and they grit their teeth and say, “Everything is great.” Have you ever met a Christian who is going through a really rough time and try to gloss over it with happy Christian talk? And to be even more holy, they drop bible verses. They walk with an open wound, they are in pain and they say things like, “It’s all good. God will use my story someday to help others.” They aren’t real. It’s like they are God’s marketing department and they are terrified to let you know, they are really torn up inside. They believe, somehow, if you know their life is perfectly perfect, they have failed God. Listen, you can’t reproduce God in you. Only the Holy Spirit can reproduce God in you. Only God can produce God. Pretend with me that you own a garden, a very large garden. It’s not been taken care of. In fact, it has been years since anyone has worked the soil. It’s full of rocks and weeds making it quit a mess. To even think about preparing the land and planting seeds would be overwhelming to you. So, what do you do? It is simply too much to do. Imagine that you called a gardener, a professional gardener. You ask if he would come and do all the necessary work in your garden to turn it into a place that would make your neighbors jealous. No one does this kind of thing any more so he shocks you when he says, “Yes.” He continues, “I would be glad to come for free but all I ask is that you come and meet me at the garden and just hang out with me while I do all the work.” Too good to be true – right? You quickly accept the terms. Free! No work! The next day you brag to everyone about this unbelievable deal you stumbled into. The next day you meet the gardener at the garden. He makes it clear, “Please sit, relax and talk with me while I do the work.” Every morning over the summer you meet the gardener at the garden. You rest; he works. It’s awkward at first, like all new relationships, but you get used to it. You talk with him and he talks with you. A strange thing happens; a relationship forms. You begin to like this guy, hanging out with him is much more fun than you thought. In fact, you begin looking forward to these moments with the gardener at the garden. The days that you can’t make it, he still comes but he notices that you aren’t there and leaves. Those days, for some reason you can’t explain, are sad days. You feel off. Something just doesn’t seem right. Through the course of the summer the garden begins to look amazing. The rocks are removed, the weeds are gone, new sprouts are growing. It’s amazing. Soon plants, gorgeous, lush plants are producing wonderful vegetables. So much so that you can’t eat it all so you do the only responsible thing, you give it away to everyone you meet. They thank you for all the hard work you put into it. You try to explain that you didn’t do anything but they look at you oddly and so you don’t even bother to explain. I tell you this story because it’s a story about you, the Holy Spirit and your heart. The garden is your heart, the gardener is the Holy Spirit. What does it mean to give God control? You hang out with Him. You invite Him to do work in your heart. That means you carve out time and space from your life to hang out with Him. You meet Him at the garden. You sit and relax. He works, He produces, He is busy every day you meet with Him. Then you take what God produced in your heart and give it to others. Things like love, joy, peace, etc. Doesn’t it sound too good to be true? Listen to what Jesus said. Did you know it is that simple? You meet the gardener at the garden and He produces while you sit and relax. And from what He does, you can give others your vegetables. How many people do you know who live like this? Is this common with your friends? How about people you know who go to church? Do they live like this? What happens if we have a messy garden and never meet the gardener? Our garden is filled with hard soil, rocks and weeds. The Holy Spirit is unable to produce all the spiritual qualities needed to live a fully redeemed life. We are busy people, restless people always searching, always working never finding. Maybe even going to church but a mess inside. A tired, worn down, mess. God’s power, His anointing is available every day but we are too busy getting a lot of things done. At the end of the summer, our garden has no produce. What do you have to do if you don’t have produce? You have to go to others, buy their produce and live off of their gardens. That means we live off the spirituality of others. We then complain about their produce. It’s not green enough. It’s not fresh enough. You might consider going to another gardener to buy their produce. The garden is your heart, the gardener is the Holy Spirit. What does it mean to give God control? You hang out with Him. You surrender. Please hear me. God is with us. It’s as relevant today as it was they day Jesus was born. Through the power of the Holy Spirit, the Holy Spirit reproduces God in us. When you leave here today, my hope is that your whole understanding of Christmas is radically changed. I want Christmas to be relevant to you today. This is a story of over two thousand years ago but what it means is, the Holy Spirit wants to reproduce God in you. You should ask yourself, “Am I becoming more loving, more joyful, more peaceful, etc. ?” Here is what I want you to do. Go hang out with the gardener. Why? Because only God can reproduce God. ← Soaring on the Wings of Eagles…Really?